Edible evergreens – who knew? This vitamin C and anti-oxidant rich Healing Conifer Tea will sooth a cough and cold, and energize you. You can make all natural tea from pine, fir, spruce, and cedar ~ it smells like a walk in the forest, and tastes lovely, too. 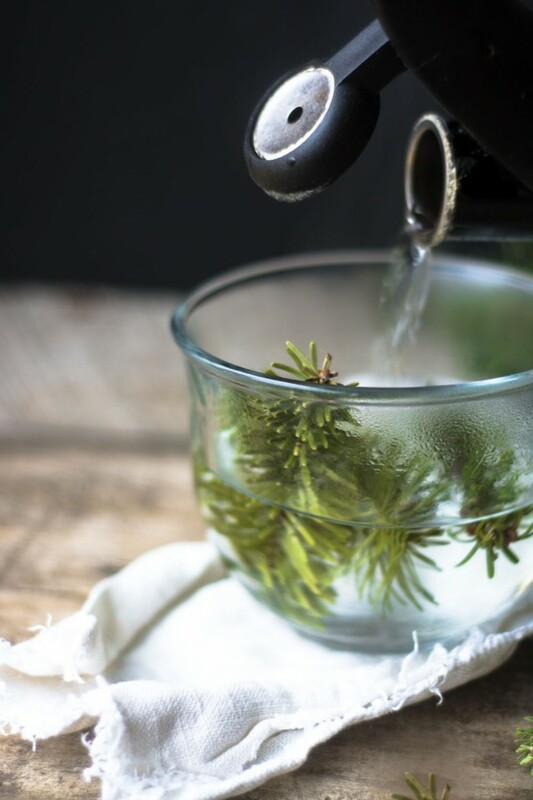 OK this is going to be fun — grab some clippers and check out your backyard, or take a stroll around the block and snip a few fresh boughs for this aromatic pine needle tea. Heck, if your Christmas tree is still around you can use that. I love nothing better than discovering and sharing new and unusual foods and flavors here at TVFGI, and edible evergreens definitely fits that bill. 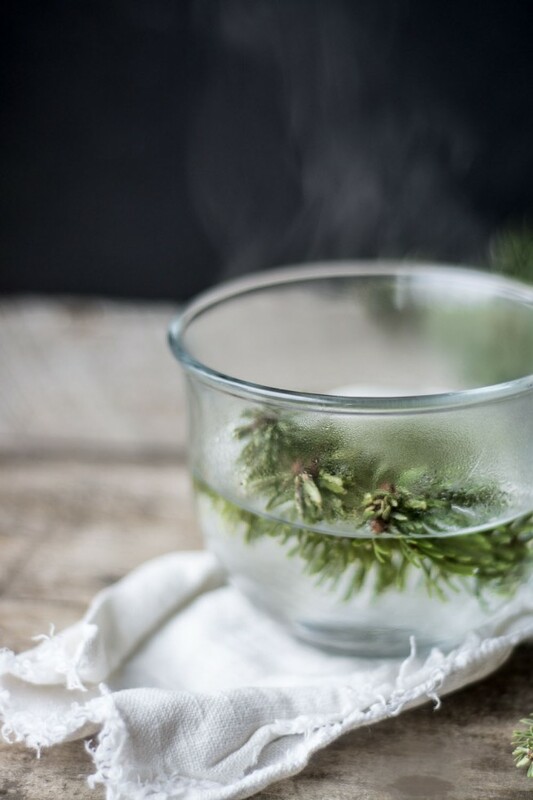 Even thought we all know and love the aroma of evergreens, it might be hard to wrap our minds around eating the stuff — but think of it this way, if you like rosemary, (which isn’t related, by the way) I think you’ll be intrigued by the flavor of this healing conifer tea. This idea fascinated me so I did a little research. Conifer is the broad name for cone bearing trees, and lots of species of conifers are edible, namely pines, spruce, and fir. 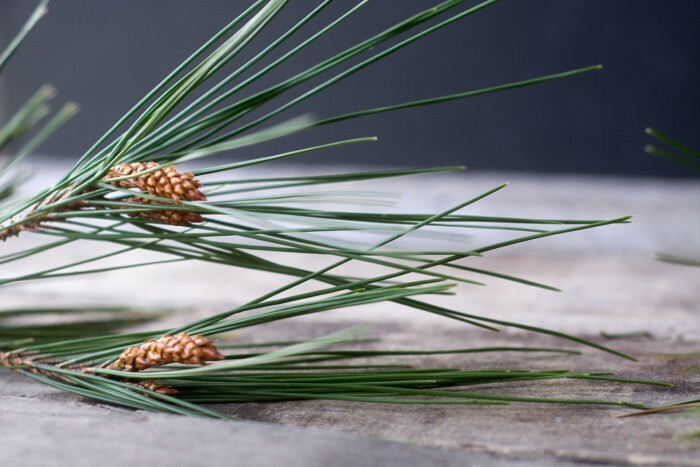 When it comes to pines, you can eat every part of them, from the pine nuts, to the bark, to the needles. The needles are not only edible, they contain a ton of vitamin C (as much or more than lemons!) and they’re naturally anti-inflammatory. 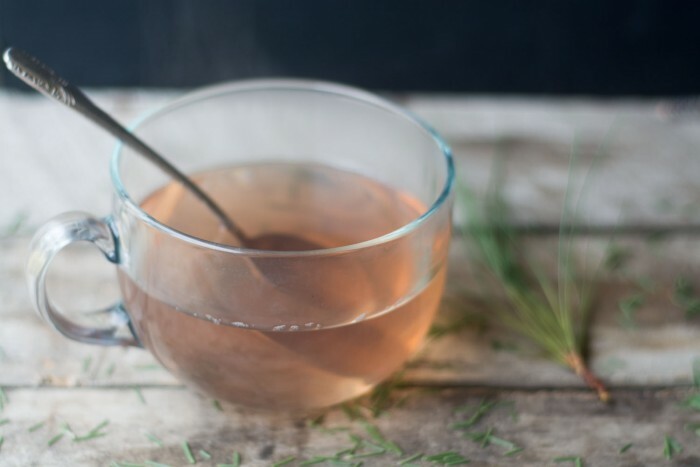 Pine needles can be made into a soothing tea that helps fight colds and coughs. That vitamin C is through the roof ~ pine tea used to be used during the Civil War to prevent scurvy ~ who knew? Pine needles are long and wispy, (above and below) and they come off the branch in little bundles of 2-5 or more needles. Fir and spruce have the more compact bushy branches, like the classic Christmas tree. You can use any of the three species for this tea, but be sure to choose trees that haven’t been sprayed or otherwise polluted. Conifers have been used for food and medicine for hundreds if not thousands of years by various cultures like the Russians, Scandinavians, and our own Native Americans. From my reading there are almost too many purported health benefits to mention, from pain relief, to anti-aging, to cold and flu relief. One of the more interesting notes is that pine and other conifer needles contain very high amounts of shikimic acid, the key ingredient in Tamiflu! Hopefully this will whet your appetite for more information on conifer infused foods, I’ve left some links at the end of the post if you’re interested. A single steeped cuppa will be light in flavor and color, above, while a simmered infusion, below, will be darker in color and flavor, I’ll show you how to make both in the recipe. You can use the needles on the twigs or off, it's up to you. They can be fresh, or dried. They can be whole, or chopped. Chopping the needles and using method 2, below, will result in the strongest flavor. Clean the needles by rinsing well under water. Put a handful of whole needles or several tablespoons of chopped needles into a saucepan and add 2 cups water. Bring to a boil, turn down the heat and simmer for 10 minutes. Let sit for 5 minutes, then strain and serve. Put a small amount of whole needles, or 1 tablespoon of chopped, into a cup. Pour in boiling water and let steep for 10 minutes, Strain and drink. If this interests you, I recommend getting a guide to edible plants so you can identify plants correctly. While most if not all pines, firs, and spruce are edible, not all evergreens are ok to eat, or drink. 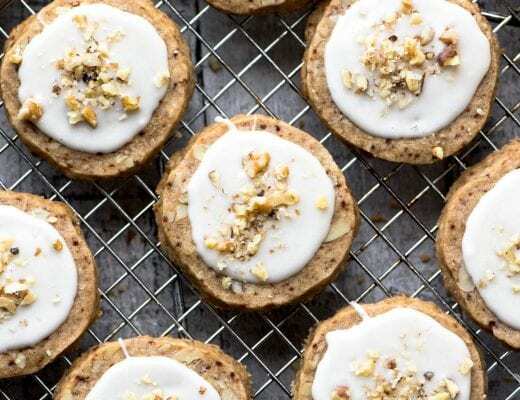 Do a little research to find the edible evergreens in your area. Watch out for Yew trees, which look like conifers but are toxic, I’ve left a link to help identify it in the list at the bottom of the post. Select fresh, green needles for use for tea. Ideally spring is the time to collect new growth needles, but you can certainly collect them at any time during the year. You can freeze the needles in freezer bags, or dry them for later use. Just let them air dry at room temperature. I think this would make wonderful iced tea or infused water in the summertime! There are unresolved questions about the safety of using pine needle tea during pregnancy, so I would err on the side of caution. 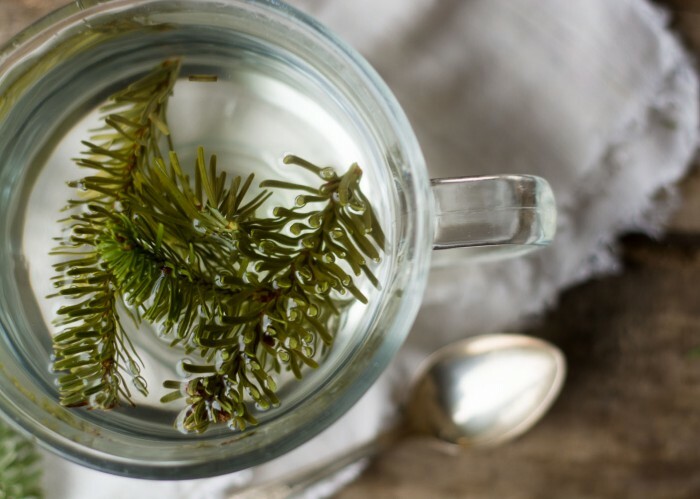 Don’t forget to pin this healing conifer tea! 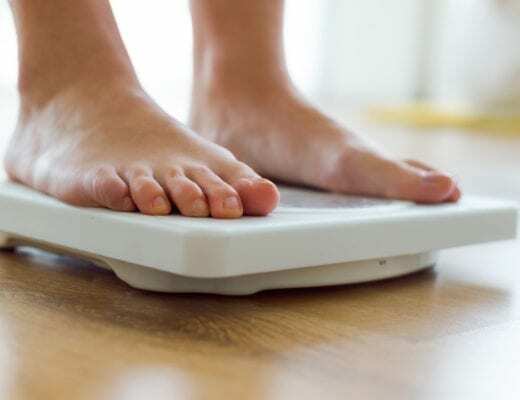 Let’s Talk BMI ~ What’s Yours and What To Do With It. Thanks so much, Sue! I first tasted “spruce tip tea” when I bought a package in the Yellowknife (NT) Airport last year, just passing through. Then, I read “Forest Bathing” recently and it brought me back again. So for the last few weeks, we have been drinking grand fir tea from the newest needles just coming out in the Southern Gulf Islands. Amazing. I just happen to have a Christmas Tree Farm and can’t wait to try this when the new buds are out in the spring! I am amazed to hear about this tea, and while a bit nervous to try it, I’m tempted to cut some pine branches from our live Christmas Tree! Such an interesting post! What an interesting recipe. 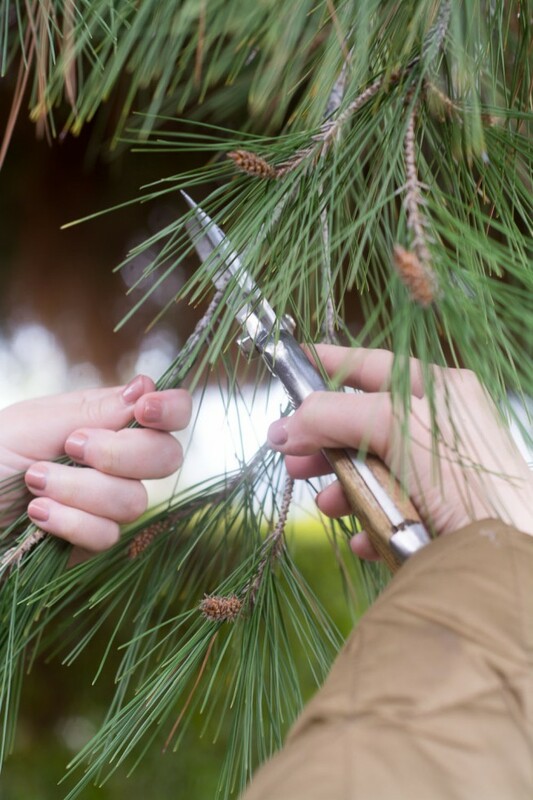 I didn’t know you could use the needles from pine trees – definitely going to give this a go! I love heading into the forest and coming out with treasures to eat! I’ve never made tea from pine needles, but I’ve put it on my list of must-dos for this year. I hope it soothes you Eileen, and feel better!! I love this post! I had no idea you could make tea from evergreens. What a great smell to fill the house too. who knew?! what a wonderful healthy-foodie find, thank you! I have always wanted to try this, but I was a little leary. I think it’s time. My pine trees had better beware! I’d love to give this a try, Sue. I didn’t know about their healing properties! I just started feeling under the weather a few days ago, so THANK YOU for posting this tea! I would have never thought to make a tea from pine needles! My back yard is COVERED with them, so this tea will be a cinch to throw together! Can’t wait to give this a try! Cheers, Sue! Fun post! I don’t use conifers — need to source some! Wonderful idea for tea — thanks. They grow all over the US so you shouldn’t have any trouble, John. Wow! I had no idea that conifers were so healthy! I love the smell, so a tea actually sounds really good. Love this idea Sue, and your photos are lovely. I agree, tea really makes the most of the pine-y aroma. When it comes to what to eat and drink in pregnancy I leave that to the experts, Louis, and so I can’t say either way. I would avoid until checking with a doctor. Wow! This post was so interesting. I would have never thought that the evergreen trees were edible. Thank you for sharing. Thanks Jennifer – I’m loving steamy photos these days, it’s so cooooold!! This is so interesting! I love it. I will take natural remedies over store bought stuff any day. Thank you for sharing! You made a reference in your blog about Rosemary. Can you do the same with fresh Rosemary and what benefits would that give you? This sounds great and I can’t wait to try! I’m a massive fan of all things wild & edible. I’ve heard that pine needles have some wonderful healing properties. My friend used to make a tea, but I’ve never tried it and quite forgot about it — so thank you for the reminder. Have you tried pine pollen yet? I’ve collected some for the first time last year and that stuff is extremely potent in healing properties as well. ? No I haven’t Audrey, but I did read about it. Good timing as I’ve been suffering from a terrible raspy cough and congestion in my sinuses for a week. I’m drinking your tea boiled with Douglas Fir needles on the twigs. Can’t taste a thing (literally, haven’t been able to taste anything for several days). I’ll let you know how it works. Question: Are the boiled needles reusable for boiling again (like bones are for broths), or should I compost them? We made pine needle tea when I was in Girl Scouts! I didn’t know about the health benefits. Thank you! That’s so great – I was a Girl Scout but I don’t think we ever did that, it makes sense, though! I bet this would open up my sinuses! TMI? Haha – this sounds so cool – and delicious. What a terrific idea. Just breathing in the steam from this tea is lovely Tricia – I did read that some people use it that way. I have a feeling this tea must smell like Christmas! And the fact that it is a healing tea is even better! Last summer I took a local foraging class and one of the highlights had been a tea we made from red cedar. I was pleasantly surprised by how good it was. It had a wonderful unexpected natural sweetness to it. I will definitely “branch” out and try a few different varieties of conifers, thanks to your post! I read about cedar tea, I’ll have to try it! Hi cool Sue, foraging is something I am very interested in, especially if it can help you feel better. This is so interesting, Sue! Love learning something new! What the what! I need to try this. I love a good piney smell, what a wonderful winter treat. The smell is what sent me off in the direction in the first place! Haha, you’re right, this is a good excuse to go for a living tree next year! Thanks for the kind words, Bita. I love herbals Tea’s, fennel being my favorite . I will try your conifer tea. I’ve never tried fennel tea, do you steep the fronds? Didn’t even know they are edible…live and learn! I’ve heard about this for a while, but only now got around to trying it out, I’m so glad I did, I’ve always loved the scent of pine. So interesting! I had no idea. Love to learn new stuff like this! It is really interesting, especially the stuff about the tamiflu…nature has so many secrets to share! I’m dying to experiment further, and a syrup is high on my list. 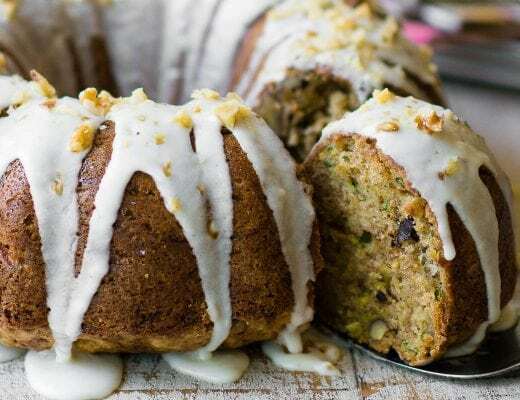 Do you have a recipe on your blog? I’ll link to it! A tea from pine needles? I’ve never heard of such thing, what an interesting idea! I bet it smells delicious, I love the smell of fresh pine!